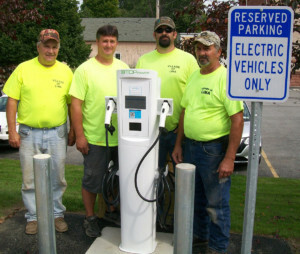 On Monday, September 17th, the Village of Lima put their new electric vehicle charging station into service. The station is located in the Village of Lima municipal parking lot located adjacent to the Lima Town Courthouse at 7327 East Main Street. Visitors are welcome to charge their electric vehicles free of charge and are encouraged to patronize Lima businesses while their vehicles charge up. The charging station was installed by the Village of Lima Department of Public Works crew and D&D Electric & Controls, LLC from Lima. Funds for the purchase and construction of the charging station were provided by a grant from the New York State Department of Environmental Conservation Municipal Zero Emission Vehicle Program, and a rebate from the New York State Energy Research and Development Authority.